As a difficult solar market emerges, are either Canadian Solar Inc. or Trina Solar worth buying today? Two of the biggest survivors of the last downturn in the solar industry in 2012 are Trina Solar Limited (NYSE:TSL) and Canadian Solar Inc. (NASDAQ:CSIQ). The two companies built low-cost manufacturing in China and were among the first to move into the project-building business, helping drive recent profitability. As the industry heads into a new set of challenges that look very similar to 2012, manufacturers are once again facing falling margins and, potentially, financial losses. Looking forward, is Trina Solar or Canadian Solar a better bet for investors? Are Trina Solar's days as a public company numbered? In theory, Trina Solar's days as a public company could be numbered. Management is leading a buyout offer for the company at $11.60 per ADS. But with shares trading at $10.02 as of Friday's close, the market isn't pricing in a high probability of the deal closing. The upside in a buyout for shareholders is currently 15.8%, and if the future is bright for solar manufacturers, the deal may close as planned. But with rough road ahead, it seems like the odds may be leaning toward the deal not closing. And that makes the operations of the two companies more important to investors. Financially, Canadian Solar and Trina Solar look very similar. Margins have echoed each other for years, and there's no sign that will change in the future. Both companies make similar commodity solar panels on similar equipment, and that'll lead to similar commodity margins as supply goes in and out of balance with demand. 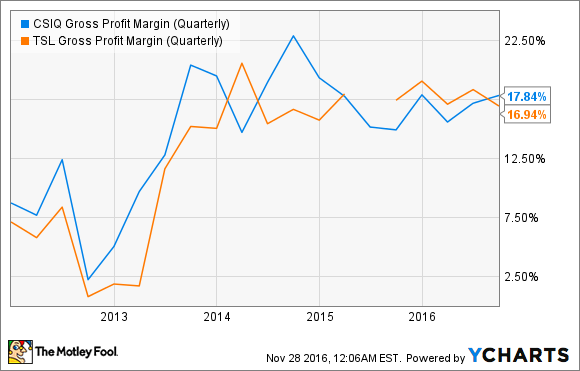 CSIQ Gross Profit Margin (Quarterly) data by YCharts. This will continue, and with solar panel prices down about 25% in the third quarter alone, these margins will begin to come down for both companies. And they'll have to rely on their balance sheets to get them through next year. What makes the analysis of solar manufacturing stocks difficult is their debt situation. You can see below that both companies are loaded with billions in debt, most of it short-term debt owed to Chinese banks. 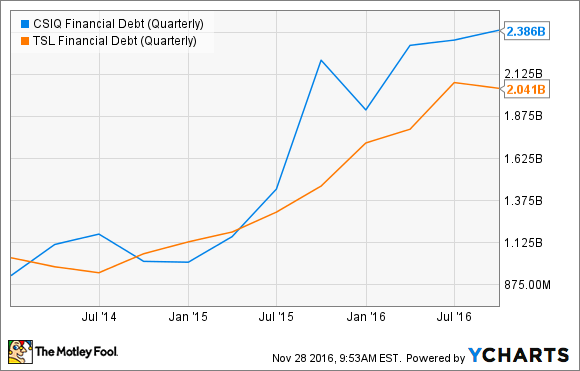 CSIQ Financial Debt (Quarterly) data by YCharts. Canadian Solar's debt position is a bit larger, but it's also holding projects on the balance sheet that it could sell to generate cash. It's the large project development business Canadian Solar has, known as Recurrent Energy, that could separate the two companies. This gives Canadian Solar some captive demand and the potential for high-margin project sales. More broadly, the real story here is that both companies have debt loads that should trouble investors. Who is the better Chinese solar manufacturer? Neither Canadian Solar or Trina Solar is particularly attractive right now given industry trends. But thanks to its project development business, I would lean toward Canadian Solar. Building projects brings captive demand and will give the company more exposure to regions outside of Asia, which is good diversification in an uncertain environment. What's obviously concerning is that debt levels are high, and it doesn't look like the next year will be profitable for many in the industry. Even with a lot of long-term potential, investors may want to wait and see who survives the industry shakeup before betting on commodity solar suppliers today.